Looking for Supplies or Gifts, or just want to shop? and the PA Grand Canyon area. Welcome to small-town America. 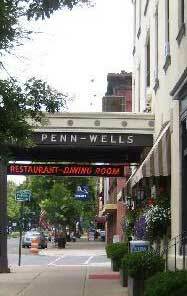 The old Victorian charm and Gas lighted boulevards of Wellsboro make it a must shop when visiting the PA Grand Canyon, along with exploring local businesses throughout Tioga, Lycoming and Potter counties. Wild Asaph Outfitters 71 Main St., Wellsboro PA 570-724-5155 Clothing, footwear, and equipment for hiking, backpacking, rock climbing, trail running, and more. Pop's Culture Shoppe 25 Main Street Wellsboro. Fun for all ages! Find toys, games, puzzles, comics, locally made gifts and more. Do you like fun? Then you will love Pop's! Garrisons Men's Shop 89-91 Main St., Wellsboro PA (570)724-3497 Quality Men's clothing. Suits and Tuxedo sales and rentals. Alterations and Dry Cleaning. Dunham's Department Store 45 Main Street Wellsboro 570-724-1905 A Tioga County tradition since 1905. The Fifth Season 100 Main St., Wellsboro 570-724-6910 Shop 4500 sq. ft. of elegant, country home decor and women's boutique; clothing, accessories, jewelry, handbags, gifts and seasonal decor. The Farmer's Daughters 11719 Route 6, Wellsboro. Home furnishings, antiques and gifts. Shabby Rue 69 Main Street, Wellsboro, PA (570)723-8809 Unique decor for your home. CS Sports 81 Main Street Wellsboro. 570-724-3858 Outdoor fun all year round. Visit downtown Wellsboro's Bike, Snowboard and Ski Experts. Sales and Service. Emerge Boutique & Gallery 28 Central Avenue, Wellsboro. Featuring local artist's paintings, photos, sculpture, jewelry and more. Mineral makeup, botanicals, salon and skin care products. Steve's Beverage Center 397 Tioga St., Wellsboro, Pa. 570-724-3282 Beer Distributor. All your favorite party supplies.